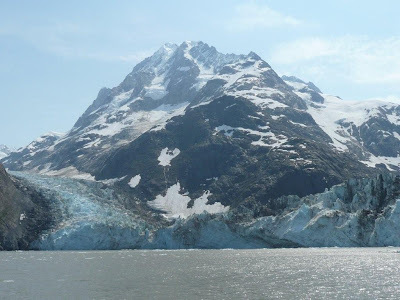 33' to Alaska: Sunday, July 05, Reid Glacier – Glaciers, Glaciers, and More Glaciers! 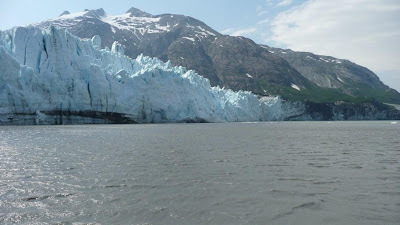 Sunday, July 05, Reid Glacier – Glaciers, Glaciers, and More Glaciers! We’re back at our Reid Glacier anchorage again after yet another magnificent, delightful, sunny, warm, and mostly calm day. Oh, it’s so nice to have sun and warmth for our third day in a row! We started our cruise by checking out traps. 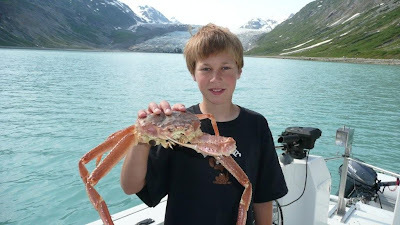 We caught two Tanner Crab, which I think are the same as Snow Crab. Yes! I’m finally getting enough seafood, almost. 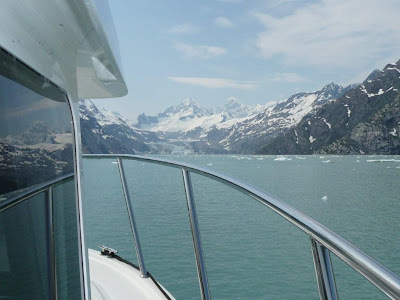 Then we sailed for Lamplugh Glacier. Cody is going to be a senior this year, so we stopped alongside and tried to get some home-taken Sr. pictures. The glacier was amazing but the wind coming off of it was pretty gusty. We’ll see how the pictures turn out. We continued on to Johns Hopkins Inlet. When we rounded the corner to head in, it seemed like heaven’s cathedral. The mountains were the most amazing we’ve seen and the glaciers were flowing down from all directions. We plowed our way to within two miles of the face, but it looked like we were within a hundred yards! I was ready to give up as the ice flow was just too thick but the crew convinced me to head for the side. Sure enough, we found a little less ice right next to shore, which was still 700 feet deep! The closer we got the less ice we had to deal with. When we got there, there was a nice big ice-free open spot for us. We got lots of great pictures and video. The wind and current coming from the glacier kept me at the helm but Val shot more pictures of the boys. We were all amazed and thought that this was the most impressive and majestic place we’ve ever been on earth! Thank you for making it, Jesus! We ate our lunch in front of the glacier…me with throttle and steering wheel in one hand and sandwich in the other, dodging ice and keeping up with wind and current. The wind kicked up a bit and seemed to spread out the ice flow. Going out was a lot easier than coming in. 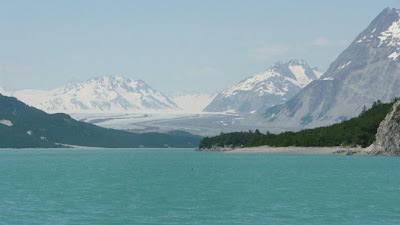 We picked our way out of Johns Hopkins and headed for Grand Pacific and Margerie Glaciers, about a dozen miles away. Grand Pacific is no longer a tide-water glacier and looks more like a 2 mile wide bull dozer rolling up everything in front of it. Right next door is Margerie Glacier and, wow, a new record…the most impressive glacier again! This one towers 250’ above the water and we could motor up as close as we dared. Each spire seemed like a skyscraper! There wasn’t much action as far as ice calving off but even the little ones cracked like thunder. I so wanted to see one of those skyscrapers drop in the water! The wind and current here are amazing…two seconds in neutral and the boat is gone with the wind! More pictures, more smiles, but time to move on. 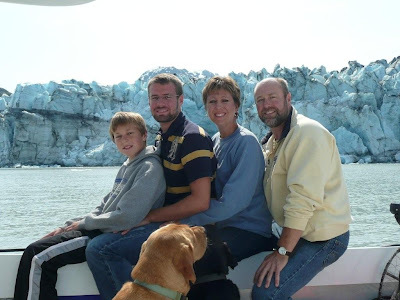 At Grand Pacific and Margerie Glacier, we are as far from Orcas as we’re going to get. This was our goal and we made it! Beyond here, the Gulf of Alaska is too scary for me and I don’t think our boat is capable; at least that’s what the insurance company says. My trip odometer says we’re 1,244 nautical miles from Orcas; we’ve burned 737 gallons of diesel, and ran the main engine for 100 hours. So, let’s do the math: 1,244x115%=1,431 statute miles divided by 737 gallons=1.94mpg including the fuel used in the genset and furnace (which isn’t much.) 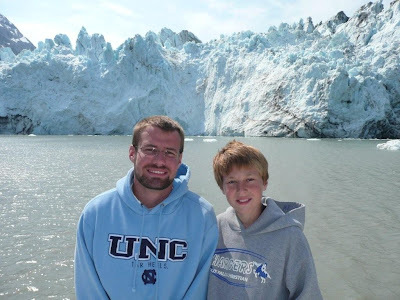 1,431 miles divided by 100 hours = 14.31 mph including anchoring, whale watching, glacier viewing, etc. I thought this might be higher. But, for as heavy as we ran, I’m really satisfied with that the speed and the economy….thankfully, fuel is about half price as last year. I like $2.27 diesel! Just as we were leaving Grand Pacific Glacier, it looked like a squall was coming through. It didn’t bother us much, until… we picked up an anchorage a few miles away in a little cove on Russell Island. No sooner did we get the anchor set and the wind began to howl. The beach across the passage looked like a fog bank but it was sand or dust being whipped up into a frenzy. I started the engine again and watched the anchor. We were whipping back and forth on the rode but the anchor held fast. I thought it might just be a quick squall but it made me too nervous so we pulled up the anchor and headed back to Reid Glacier, only about 5 miles away. So, here we are again, right where we started this morning, but it was a beautiful touring day. Now, the grill is going, sun is shining and the winds are settled. Another great day in Glacier Bay, Alaska. For those of you who know me, you’ll know that some of my favorite verses in the Bible come from Job 38. Can you imagine God painting the picture for a man who likely spent his life in the desert? I thought of these verses often today. If you get a chance, you should read all of Job 38 & 39! Our God is so good! "Where were you when I laid the earth's foundation? Tell me, if you understand. Who marked off its dimensions? Surely you know! Who stretched a measuring line across it? On what were its footings set, or who laid its cornerstone- while the morning stars sang together and all the angels shouted for joy? "Who shut up the sea behind doors when it burst forth from the womb, when I made the clouds its garment and wrapped it in thick darkness, when I fixed limits for it and set its doors and bars in place, when I said, 'This far you may come and no farther; here is where your proud waves halt'? "Have you ever given orders to the morning, or shown the dawn its place, that it might take the earth by the edges and shake the wicked out of it? The earth takes shape like clay under a seal; its features stand out like those of a garment. The wicked are denied their light, and their upraised arm is broken. "Have you journeyed to the springs of the sea or walked in the recesses of the deep? Have the gates of death been shown to you? Have you seen the gates of the shadow of death? Have you comprehended the vast expanses of the earth? Tell me, if you know all this. "What is the way to the abode of light? And where does darkness reside? Can you take them to their places? Do you know the paths to their dwellings? Surely you know, for you were already born! You have lived so many years! "Have you entered the storehouses of the snow or seen the storehouses of the hail, which I reserve for times of trouble, for days of war and battle? What is the way to the place where the lightning is dispersed, or the place where the east winds are scattered over the earth? Who cuts a channel for the torrents of rain, and a path for the thunderstorm, to water a land where no man lives, a desert with no one in it, to satisfy a desolate wasteland and make it sprout with grass? Does the rain have a father? Who fathers the drops of dew? From whose womb comes the ice? Who gives birth to the frost from the heavens when the waters become hard as stone, when the surface of the deep is frozen? "Can you bind the beautiful Pleiades? Can you loose the cords of Orion? Can you bring forth the constellations in their seasons or lead out the Bear with its cubs? Do you know the laws of the heavens? Can you set up God's dominion over the earth? "Can you raise your voice to the clouds and cover yourself with a flood of water? o you send the lightning bolts on their way? Do they report to you, 'Here we are'? Who endowed the heart with wisdom or gave understanding to the mind? Who has the wisdom to count the clouds? Who can tip over the water jars of the heavens when the dust becomes hard and the clods of earth stick together? "Do you hunt the prey for the lioness and satisfy the hunger of the lions when they crouch in their dens or lie in wait in a thicket? Who provides food for the raven when its young cry out to God and wander about for lack of food?